Photo: Kincaid House (Kincaid-Russell House), ca. 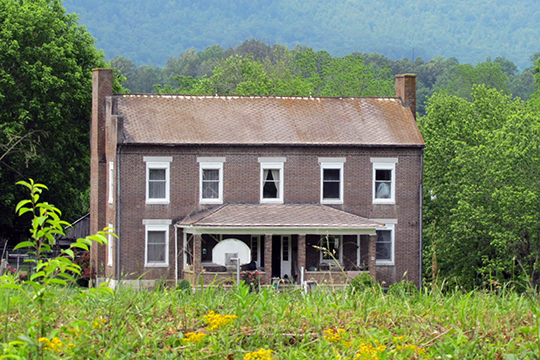 1840, Russell Lane, Speedwell, TN. Listed on the National Register of Historic Places in 1982. Photographed by user: Brian Stansberry (own work), 2015, [cc-by-3.0 (creativecommons.org/licenses/by/3.0)], via Wikimedia Commons, accessed October, 2015. Claiborne County administrative offices are located at 1740 Main Street, Tazewell, TN 37879; phone: 423-626-3283. Claiborne County  was formed in 1801 from parts of Grainger and Hawkins Counties and named for William C.C. Claiborne, Tennessee's first congressional representative. The most important historic feature of Claiborne County is the Cumberland Gap, located south of the convergence of Tennessee, Virginia, and Kentucky. Native Americans called this natural gateway to the north and west the "Warrior's Path." In 1750 Dr. Thomas Walker claimed discovery of the gap and named it Cumberland Gap in honor of William Augustus, Duke of Cumberland, the son of King George II and Queen Caroline. In 1775 Daniel Boone led thirty men through the gap and opened a road west to settlement. Welcome to Claiborne County, Tennessee, www.claibornecounty.com, accessed October, 2015.